The optic nerve carries information from the eye to the brain. 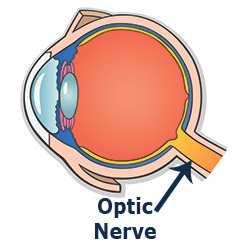 Damage to the optic nerve can cause severe vision loss. Many eye diseases threaten the optic nerve. This is why Dr. Grossman at Natural Eye Care created formulas that support the optic nerve. His Herbal Coleus Ultra Formula is a select mixture of wild crafted herbs for optic nerve support (also see his new wild crafted formula Dr. Grossman’s Bilberry/Gingko Combination for supporting healthy circulation and blood vessels). For example, one of the more well-known eye diseases is glaucoma. Affecting mostly seniors, glaucoma is a cluster of diseases that impact the ocular nerve. High intraocular pressure called “open-angle glaucoma” is the most common form of glaucoma, but there are many cases of diagnosed glaucoma where the eye pressure is actually normal or even low. Glaucoma is known at the “silent thief,” because there are typically no symptoms except at one point the patient notices poorer peripheral vision. This is why regular eye exams (typically annually) is important. These diseases damage the optic nerve: glaucoma, optic neuritis, Leber’s hereditary optic neuropathy, toxic optic neuropathy, nutritional optic neuropathy, compressed optic neuropathy, syphilis (untreated), and tumors or growths that press on the optic nerve. Even high blood pressure, low thyroid and/or poor absorption of nutrients (assuming a good diet) can even negatively effect the optic nerve. There are numerous studies relating poor circulation and/or poor availability of essential nutrients reaching the eyes as being a big factor in glaucoma and maintaining the health of the optic nerve (and retina). Herbal Coleus Ultra Formula contains three wild crafted herbs: coleus forskohlii, Lycii Berry (Goji Berry) and Bilberry. The antidote for oxidative stress is antioxidants. Antioxidants slow or prevent the oxidation of key biochemicals in the eye; such oxidation creates an environment in which free radicals that cause cellular damage flourish. Coleus forskohlii is a strong antioxidant. This herb relaxes smooth muscles in the body, which may be the reason for its beneficial effect in reducing intraocular pressure (as well as helping lower blood pressure). See research on Coleus forskohlii and glaucoma. Take 15 drops by mouth two to three times per day, or as recommended by a healthcare practitioner. Best if mixed with an ounce of water before meals, or an hour after meals. Dr. Grossman’s Herbal Coleus Ultra Formula can be taken alone, or it can be mixed with Dr. Grossman’s ReVision Formula.